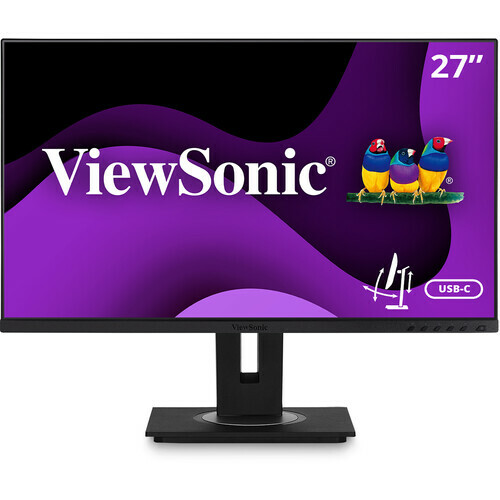 The VG2755 27" 16:9 IPS Monitor from ViewSonic is an enterprise-grade monitor designed for the modern day office. Built with an In-Plane Switching panel, it provides you with vivid colors and wide 178° viewing angles. Specs-wise, it has a 1920 x 1080 Full HD resolution, a 1000:1 static contrast ratio, a 250 cd/m² brightness rating, and support for 16.7 million colors. For compatibility with a wide range of systems, it's equipped with USB Type-C, HDMI, DisplayPort, and even VGA ports. Once it's connected to your computer, you can adjust its versatile stand to best fit your viewing preference, or install an optional VESA mount, stand, or arm if needed. This monitor is built with Flicker-Free and Blue Light Filter technologies to help reduce eyestrain and fatigue over extended viewing periods. ViewSonic's ViewMode features application-optimized presets that alters the display's gamma curve, color temperature, contrast, and brightness. These presets include Game, Movie, Web, Text, and Mono. Box Dimensions (LxWxH) 27.0 x 17.0 x 8.5"